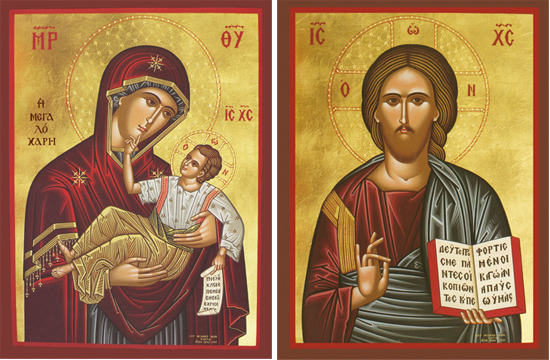 Here is the third Matched Set of icons of Christ and His Holy Mother. They were painted by the Monk Michael from Mount Athos in Greece in 1989. Icons are described as windows into the Heavenly Realms by the Fathers of the Church, as we do not just look at icons, but through them. As we look into Heaven, in some mysterious way, Heaven then looks out at us. This is why icons have always been such an important part of the Church, why the Lord made the first icon “Not Made By Hands” of His Face and sent it to King Abgar of the neighboring Kingdom of Edessa, why St. Luke went to see the Virgin and made the first painted icons of her from life, why these prototypes and those which followed were so carefully reproduced and copied over and over again, to let us see a view of things as they shall be at the end of time, as they appear without the distortion of our sinful minds and hearts, a revelation of God and His Holy Saints. The focus of the Seventh Ecumenical Council was about the correctness of the veneration of the Holy Icons, a revelation of Christ’s Incarnation. It is important to remember just how important icons are to develop and maintain a proper spiritual life, for we focus through the Holy Icons to see through these windows a glimpse of Heaven Itself.